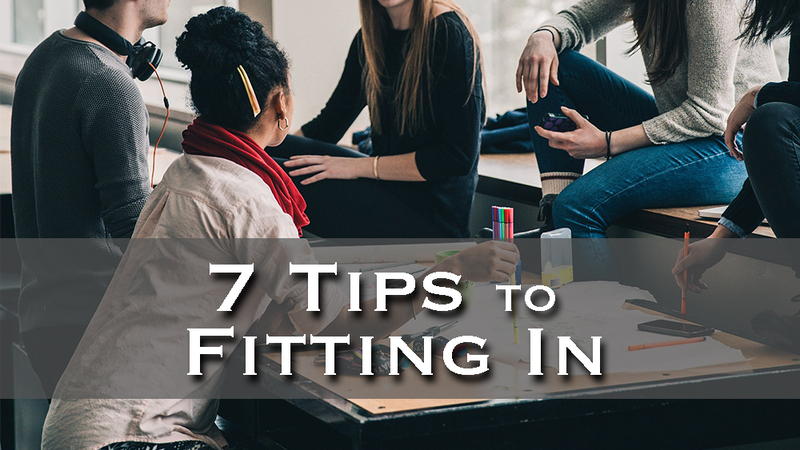 Have you struggled with fitting in? Have you been left out by others in the office or class? Do you sometimes feel unpopular? There is no great formula to fitting in, but there are a few tips I can share with you that might just help you win the acceptance from those you would like it from. Here are seven tips to being popular. First off it is practically impossible to be liked by everybody and stay true to being yourself. However I have met people who are like chameleons that will become like whoever they want acceptance from. This mythology is destined to fail, because one, you will either forget yourself, or two, you will boil over in frustration from not being who you are. So to sum it up, be true to who you are and don’t fake nicy nice to win friends. A person I knew operated like this and they found that they never developed true close friendships. The reason is simple, if they get close to somebody, that somebody will see who they truly are and hence their fake cover is blown. You can’t fake it for a long time, for eventually you will be caught out as fake. So forget insecurities, there are people out there who will like you for you. There is nobody liked by everybody, even if it seems like they are. Be true to yourself and don’t let people change you for the worse. Some people might grate on your nerves and truly drive you up the wall with their stupid concepts and silly ways. But stop, just because they are stupid and silly to you doesn’t make you the bench mark for deciding who is normal, who is right, and who shall be popular. Instead realize that thankfully not everybody is like you and this is what makes the world so interesting at times. My suggestion would be to simply accept their opinion as “THEIR” opinion, and don’t try to change their opinion to your opinion. Of course discuss different opinions, but if it is getting heated or tension is ensuing, then just leave it. Interestingly, it amazes how stubborn people will get when you try and force them to change their mind. So to argue opinions just causes fall outs and little chance of anyone winning out. The truth is people prefere to be right rather than compassionate, for we must start to move beyond toleration and toward appreciation of others. Accept peoples differences even if you don’t agree with them. Most of us mere mortals have a pedastel. A position in our lives that whomever resides on top of it is the one whom will get the best from us. The truth is we may have pedastal 2 and 3 but its nearly always ourselves whom reside on the NO.1 hot seat. But here is a challenge. By putting somebody else on the pedestal, that we so often put ourselves, will demote your ego to second place and promote their needs to first place. Whenever we put our egos in the back seat is always a good thing as far as character is concerned. I’m not saying to put somebody on a pedestal to the point we worship them for that would be crazy. What I am saying is rather than you putting yourself and your needs first place, how about putting somebody else’s needs in that place. To be liked means demoting yourself and promoting other peoples interests above your own. Have you ever been out with a group of friends and you are standing in a circle trying to decide what movie, what restaurant, or what time to meet? Well I love my friends but not all of us would share the same taste in movies. I love a great action, thriller, or rom-com, but some of my friends rather serious dramas and true stories which is ok too but wouldn’t be Fiona or myselfs personal preference. With normally decide with majority votes on the movie. This has proved to be a great way to pick movies. However sometimes somebody won’t be happy with the movie choice, but I have observed that its not about the movie, but more about having the craic with your mates. Fiona has gone to so many movies she didn’t want to see, but she went anyway for it was about having fun. Its all about compromise and even when you don’t get your way, so what! Its about having fun with your friends, not the actual movie or the restaurant. I have seen friendships falling out because somebody didn’t get their way and made a fuss about it. Started gossiping about their friends to mutual friends, and on and on it went until the friendship was broken. That person can now watch any movie they want, but sadly they have nobody to watch it with. Compromising is easy until you have to do it. The love boat was a show about a boat that always had fun, laughter, and good stories of friendships, I will state it was before my time. However in reality, the Loveboat doesn’t sail in society as much as we would like. Society can be selfish as a whole, but we don’t have to conform to this lack of love in the world. To be liked, first starts by you liking others as much as you like yourself. Not flirting, or faking, but instead letting people know who you are and at the same time accepting them for who they are. Treat people the way you want to be treated. When somebody asks “how are you doing?”. Give an answer, be courteous, even if you’ve had a bad day. Personally I always will reply to somebody who asks, even if I’m in a rush or have got lots to do. Another way of being approachable is by starting conversation with others. For example I was standing in a cue one day and a guy was in front of me waiting aswell. I struck up a conversation and 10 minutes later he was giving me a contact that would help my business. Just from saying hello got me this great contact. Just by being friendly opened up an opportunity. So it sometimes even “pays” to be friendly. However if I was wearing earphones or on my phone, this would all work in making me unapproachable. Look friendly, and be friendly. Wear a smile more than a frown and it will get nicer attention. Obviously if you go around smiling all the time people might think you are on something, so keep it real. You’ve done all you know to do and still they don’t like you! You weren’t being nice for their sake, you were being nice for you. You now know that being nice is the right way to be and if people don’t like you, you don’t mind. You simply continue to be nice, and move on. Everybody in life is not going to like you, so enjoy this new character trait and chillax. Forget about what people say about you and continue to be real nice. The way to be liked, is for you to like them first. Leave your comments below or email me and let me know your thoughts on the topic.